Other researchers from Stanford, Oxford, Hasselt University in Belgium, and SunPreme Inc. are coauthors of the study. They report their research in the journal Science. Source: Republished from Futurity.org as a derivative work under the Attribution 4.0 International license. Original article posted to Futurity by Mark Shwartz-Stanford. A new fabric harvests energy from both sunshine and motion at the same time. Fabrics that can generate electricity from physical movement have been in the works for a few years, and this is the next step. Combining two types of electricity generation into one textile paves the way for developing garments that could provide their own source of energy to power devices such as smartphones or GPS. “This hybrid power textile presents a novel solution to charging devices in the field from something as simple as the wind blowing on a sunny day,” says Zhong Lin Wang, professor in the Georgia Institute of Technology’s School of Materials Science and Engineering. Wang envisions that the new fabric, which is 320 micrometers thick woven together with strands of wool, could be integrated into tents, curtains, or wearable garments. “The fabric is highly flexible, breathable, lightweight, and adaptable to a range of uses,” Wang says. In one of their experiments, Wang’s team used a fabric only about the size of a sheet of office paper and attached it to rod like a small colorful flag. Rolling down the windows in a car and letting the flag blow in the wind, the researchers were able to generate significant power from a moving car on a cloudy day. The researchers also measured the output by a 4-by-5-centimeter piece, which charged up a 2 mF commercial capacitor to 2 volts in one minute under sunlight and movement. “That indicates it has a decent capability of working even in a harsh environment,” Wang says. While early tests indicate the fabric can withstand repeated and rigorous use, researchers will be looking into its long-term durability. Next steps also include further optimizing the fabric for industrial uses, including developing proper encapsulation to protect the electrical components from rain and moisture. The work appears in the journal Nature Energy. By Peter Byrley, University of California, Riverside. With hydrogen power stations in California, a new Japanese consumer car and portable hydrogen fuel cells for electronics, hydrogen as a zero emission fuel source is now finally becoming a reality for the average consumer. When combined with oxygen in the presence of a catalyst, hydrogen releases energy and bonds with the oxygen to form water. The two main difficulties preventing us from having hydrogen power everything we have are storage and production. At the moment, hydrogen production is energy-intensive and expensive. Normally, industrial production of hydrogen requires high temperatures, large facilities and an enormous amount of energy. In fact, it usually comes from fossil fuels like natural gas – and therefore isn’t actually a zero-emission fuel source. Making the process cheaper, efficient and sustainable would go a long way toward making hydrogen a more commonly used fuel. An excellent – and abundant – source of hydrogen is water. But chemically, that requires reversing the reaction in which hydrogen releases energy when combining with other chemicals. That means we have to put energy into a compound, to get the hydrogen out. Maximizing the efficiency of this process would be significant progress toward a clean-energy future. One method involves mixing water with a helpful chemical, a catalyst, to reduce the amount of energy needed to break the connections between hydrogen and oxygen atoms. There are several promising catalysts for hydrogen generation, including molybdenum sulfide, graphene and cadmium sulfate. My research focuses on modifying the molecular properties of molybdenum sulfide to make the reaction even more effective and more efficient. Hydrogen is the most abundant element in the universe, but it’s rarely available as pure hydrogen. Rather, it combines with other elements to form a great many chemicals and compounds, such as organic solvents like methanol, and proteins in the human body. Its pure form, H₂, can used as a transportable and efficient fuel. There are several ways to produce hydrogen to be usable as fuel. Electrolysis uses electricity to split water into hydrogen and oxygen. Steam methane reforming starts with methane (four hydrogen atoms bound to a carbon atom) and heats it, separating the hydrogen from the carbon. This energy-intensive method is usually how industries produce hydrogen that is used in things like producing ammonia or the refining of oil. The method I’m focusing on is photocatalytic water splitting. With a catalyst’s help, the amount of energy needed to “split” water into hydrogen and oxygen can be provided by another abundant resource – light. When exposed to light, a proper mixture of water and a catalyst produces both oxygen and hydrogen. This is very attractive to industry because it then allows us to use water as the source of hydrogen instead of dirty fossil fuels. Just as not every two people start up a conversation if they’re in the same elevator, some chemical interactions don’t occur just because the two materials are introduced. Water molecules can be split into hydrogen and oxygen with the addition of energy, but the amount of energy needed would be more than would be generated as a result of the reaction. Sometimes it takes a third party to get things going. In chemistry, that’s called a catalyst. Chemically speaking, a catalyst lowers the amount of energy needed for two compounds to react. Some catalysts function only when exposed to light. 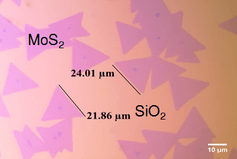 These compounds, like titanium dioxide, are called photocatalysts. With a photocatalyst in the mix, the energy needed to split water drops significantly, so that the effort nets an energy gain at the end of the process. We can make the splitting even more efficient by adding another substance, in a role called co-catalyst. Co-catalysts in hydrogen generation alter the electronic structure of the reaction, making it more effective at producing hydrogen. So far, there aren’t any commercialized systems for producing hydrogen this way. This is in part because of cost. The best catalysts and co-catalysts we’ve found are efficient at helping with the chemical reaction, but are very expensive. For example, the first promising combination, titanium dioxide and platinum, was discovered in 1972. Platinum, however, is a very expensive metal (well over US$1,000 per ounce). Even rhenium, another useful catalyst, costs around $70 an ounce. Metals like these are so rare in the Earth’s crust that this makes them not suitable for large-scale applications even though there are processes being developed to recycle these materials. There are many requirements for a good catalyst, such as being able to be recycled and being able to withstand the heat and pressure involved in the reaction. But just as crucial is how common the material is, because the most abundant catalysts are the cheapest. 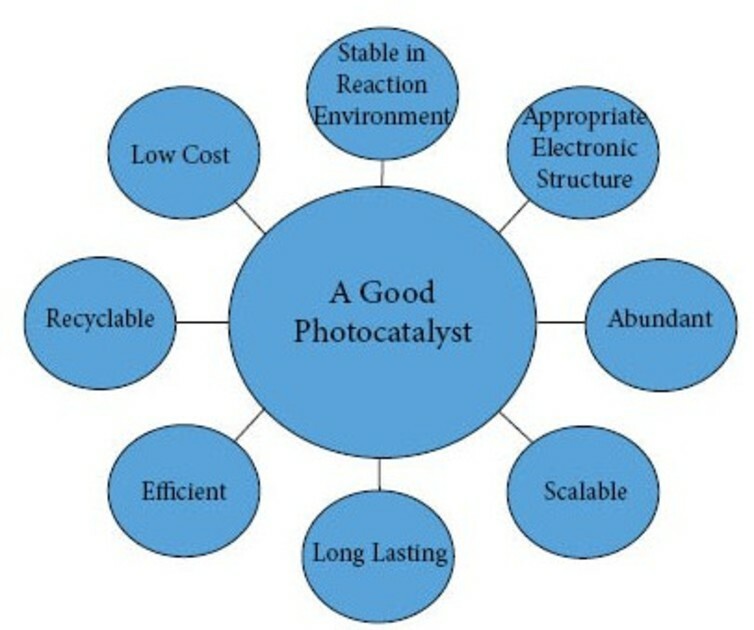 Properties of a good photocatalyst. One of the newest and most promising materials is molybdenum sulfide, MoS₂. Because it is made up of the elements molybdenum and sulfur – both relatively common on Earth – it is far cheaper than more traditional catalysts, well under a dollar per ounce. It also has the correct electronic properties and other attributes. Before the late 1990s, researchers had found that molybdenum sulfide was not particularly effective at turning water into hydrogen. But that was because researchers were using thick chunks of the mineral, essentially the form it’s in when mined from the ground. Today, however, we can use processes like chemical vapor deposition or solution-based processes to create much thinner crystals of MoS₂ – even down to the thickness of a single molecule – which are vastly more efficient at extracting hydrogen from water. Molybdenum sulfide can be made even more effective by manipulating its physical and electrical properties. A process known as “phase change” makes more of the substance available to participate in the hydrogen-producing reaction. When molybdenum sulfide forms crystals, the atoms and molecules on the outside of the solid mass are ready to accept or donate electrons to water when excited by light to drive the creation of hydrogen. Normally, the MoS₂ molecules on the inside of the structure will not donate or accept electrons as efficiently as the edge sites, and so can’t help as much with the reaction. But adding energy to the MoS₂ by bombarding it with electrons, or increasing the surrounding pressure, causes what is called “phase change” to occur. This phase change is not what you learn in basic chemistry (involving one substance taking forms of gas, liquid or solid) but rather a slight structural change in the molecular arrangement that changes the MoS₂ from a semiconductor to a metal. As a result, the electrical properties of the molecules on the inside become available to the reaction as well. This makes the same amount of catalyst potentially 600 times more effective in the hydrogen evolution reaction. If the methods behind this sort of breakthrough can be perfected, then we may be a big step closer to making hydrogen production cheaper and more efficient, which in turn will move us toward a future powered by truly clean, renewable energy. By Tara P. Dhakal, Binghamton University, State University of New York. Global demand for energy is increasing by the hour as developing countries move toward industrialization. Experts estimate that by the year 2050, worldwide demand for electricity may reach 30 terawatts (TW). For perspective, one terawatt is roughly equal to the power of 1.3 billion horses. Energy from the sun is limitless – the sun provides us 120,000 TW of power at any given instant – and it is free. But today solar energy provides only about one percent of the world’s electricity. The critical challenge is making it less expensive to convert photo-energy into usable electrical energy. To do that, we need to find materials that absorb sunlight and convert it into electricity efficiently. In addition, we want these materials to be abundant, environmentally benign and cost-effective to fabricate into solar devices. Researchers from around the world are working to develop solar cell technologies that are efficient and affordable. The goal is to bring the installation cost of solar electricity below US$1 per watt, compared to about $3 per watt today. At Binghamton University’s Center for Autonomous Solar Power (CASP), we are investigating ways to make thin film solar cells using materials that are abundant in nature and nontoxic. We want to develop solar cells that are reliable, highly efficient at converting sunlight to electricity and inexpensive to manufacture. We have identified two materials that have great potential as solar absorbers: pyrite, better known as fool’s gold because of its metallic luster; and copper-zinc-tin-sulfide (CZTS). 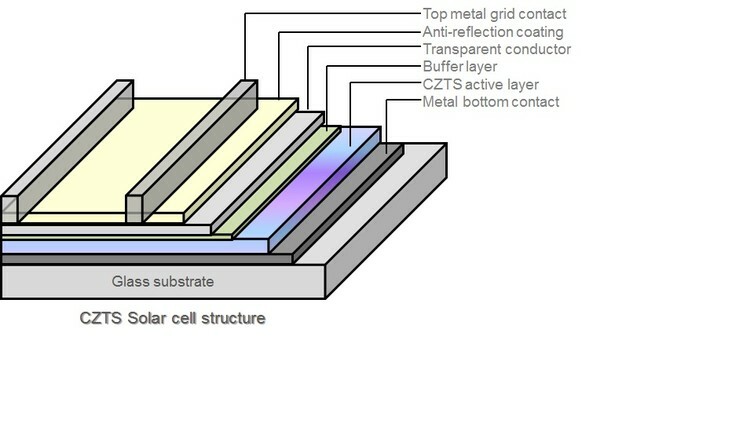 Today’s commercial solar cells are made from one of three materials: silicon, cadmium telluride (CdTe) and copper-indium-gallium-selenide (CIGS). Each has strengths and weaknesses. Silicon solar cells are highly efficient, converting up to 25 percent of the sunlight that falls on them into electricity, and very durable. However, it is very expensive to process silicon into wafers. And these wafers have to be very thick (about 0.3 millimeters, which is thick for solar cells) to absorb all of the sunlight that falls on them, which further increases costs. Silicon solar cells – often referred to as first-generation solar cells – are used in the panels that have become familiar sights on rooftops. Our center is studying another type called thin film solar cells, which are the next generation of solar technology. As their name suggests, thin film solar cells are made by putting a thin layer of solar absorbent material over a substrate, such as glass or plastic, which typically can be flexible. These solar cells use less material, so they are less expensive than crystalline solar cells made from silicon. It is not possible to coat crystalline silicon on a flexible substrate, so we need a different material to use as a solar absorber. Although thin film solar technology is improving rapidly, some of the materials in today’s thin film solar cells are scarce or hazardous. For example, the cadmium in CdTe is highly toxic to all living things and is known to cause cancer in humans. CdTe can separate into cadmium and tellurium at high temperatures (for example, in a laboratory or housefire), posing a serious inhalation risk. We are working with pyrite and CZTS because they are nontoxic and very inexpensive. CZTS costs about 0.005 cents per watt, and pyrite costs a mere 0.000002 cents per watt. They also are among the most abundant materials in the Earth’s crust, and absorb the visible spectrum of sunlight efficiently. These films can be as thin as 1/1000th of a millimeter. We need to crystallize these materials before we can fabricate them into solar cells. This is done by heating them. CZTS crystallizes at temperatures under 600 degree Celsius, compared to 1,200 degrees Celsius or higher for silicon, which makes it less expensive to process. 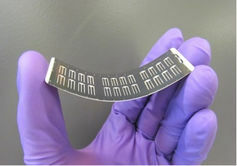 It performs much like high-efficiency copper indium gallium selenide (CIGS) solar cells, which are commercially available now, but replaces the indium and gallium in these cells with cheaper and more abundant zinc and tin. So far, however, CZTS solar cells are relatively inefficient: they convert less than 13 percent of the sunlight that falls upon them to electricity, compared to 20 percent for more expensive CIGS solar cells. We know that CZTS solar cells have a potential to be 30 percent efficient. The main challenges are 1) synthesizing high-quality CZTS thin film without any traces of impurities, and 2) finding a suitable material for the “buffer” layer underneath it, which helps to collect the electric charges that sunlight creates in the absorber layer. Our lab has produced a CZTS thin film with seven percent efficiency; we hope to approach 15 percent efficiency soon by synthesizing high-quality CZTS layers and finding suitable buffer layers. Pyrite is another potential absorber that can be synthesized at very low temperatures. Our lab has synthesized pyrite thin films, and now we are working to layer those films into solar cells. This process is challenging because pyrite breaks down easily when it is exposed to heat and moisture. We are researching ways to make it more stable without affecting its solar absorbency and mechanical properties. If we can solve this problem, “fool’s gold” could turn into a smart photovoltaic device. In a recent study, researchers at Stanford University and the University of California at Berkeley estimated that solar power could provide up to 45 percent of U.S. electricity by 2050. To meet that target, we need to keep driving down the cost of solar power and find ways to make solar cells more sustainably. We believe that abundant, nontoxic materials are key to realizing the potential of solar power. The Supreme Court ruling paves the way for innovative businesses, such as earning money for excess power from solar panels and electric vehicle batteries. The energy source that many believe will be the “Holy Grail” of energy sources is fusion. In theory, if we we can create a controlled fusion reaction here on Earth, then we will have an energy source that is as perpetual and abundant as the sun. A new way to capture and harness energy from the air could lead to paper-based wireless sensors that are self-powered, low-cost, and able to function independently almost anywhere. 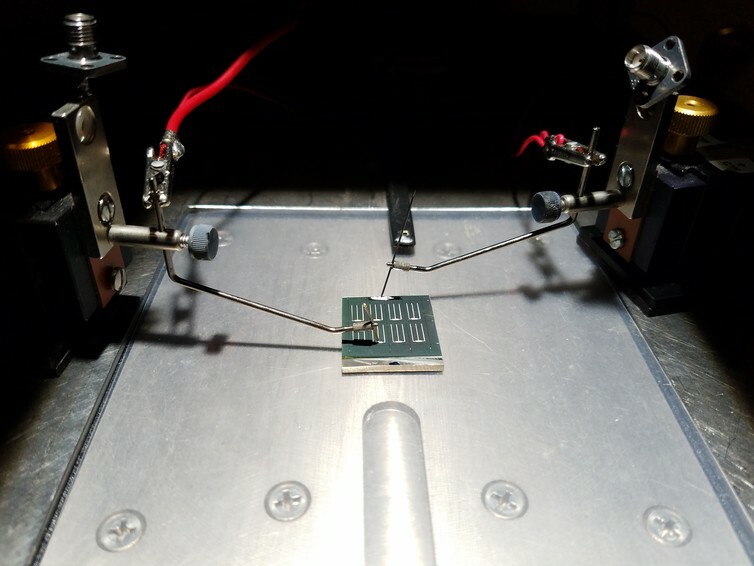 By combining energy-scavenging technology with super-capacitors and cycled operation, researchers expect to be able to power devices requiring above 50 milliwatts. In this approach, energy builds up in a battery-like supercapacitor and is utilized when the required power level is reached. The researchers have already successfully operated a temperature sensor using electromagnetic energy captured from a television station that was half a kilometer away and are preparing another demonstration in which a microprocessor-based microcontroller would be activated simply by holding it in the air. Exploiting a range of electromagnetic bands increases the dependability of energy-scavenging devices, Tentzeris says. If one frequency range fades temporarily due to usage variations, the system can still exploit other frequencies. Continue reading to learn the uniquely simple way that the team created these devices and the applications they envision for them. On April 30, Tesla’s Elon Musk took the stage in California to introduce the company’s Powerwall battery energy storage system, which he hopes will revolutionize the dormant market for household and utility-scale batteries. A few days later, the Supreme Court announced that it would hear a case during its fall term that could very well determine whether Tesla’s technology gamble succeeds or fails. Justices will hear arguments on October 14 to address questions having to do with federal jurisdiction over the fast-changing electricity business. At issue is an obscure federal policy known in the dry language of the electricity business as “Order 745,” which a lower court vacated last year. Order 745 allowed electricity customers to be paid for reducing electricity usage from the grid – a practice known as “demand response.” It also stipulated that demand response customers would be paid the market price for not using the grid – like the power industry’s version of paying farmers not to grow corn. Paying people not to use electricity may sound preposterous – one critique of Order 745 was that it permitted overly generous prices and lax performance standards, basically making demand response a license for electricity consumers to print money. But research, including some of my own, has shown that demand response can make markets operate more efficiently, temper the market power held by power generating companies and reduce the risk of blackouts. The Order 745 case has already proven to be a major disruption in the US electricity market. It has thrown uncertainty into business models, market prices, and in some cases even the planning of the power grid to ensure reliability in the coming years. The case, however, ultimately goes far beyond demand response. In fact, Order 745 could very well be the biggest energy-related Supreme Court case in decades. 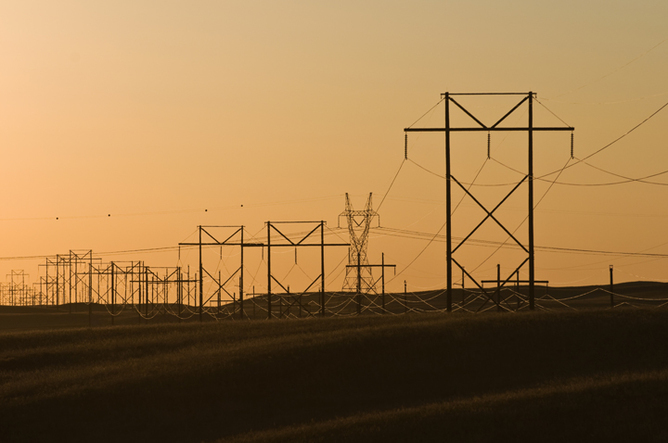 Historically, federal authorities, notably the Federal Energy Regulatory Commission (FERC), had jurisdiction only over long-distance transmission lines. The significance of this particular case is rooted in the two different and opposing directions in which technology, policy and good old consumer behavior are pushing and pulling the business of electricity. On the one hand is a federal policy of playing a greater role in the business of managing the regional power grid, supplanting the traditional electric utility. Regional organizations now manage portions of the national grid for more than 70% of all electricity consumed in the US. The simultaneous trends of regional grid management and democratized electricity supply are now in tension with one another, not for any technological reason, but primarily for reasons of policy and economics. The Federal Power Act, which was passed in 1935, attempts to draw a “bright line” between those elements of the electricity system that are under federal versus state jurisdiction. The federal role is to regulate the regional transmission grid – including the power lines that transport electricity long distances and across state lines – and wholesale markets for buying and selling power. The role of the states is limited to the local grid that delivers electricity to homes and businesses and to retail sales. Market rules like Order 745 provided a pathway for these two trends to be complementary, rather than in opposition, without a patchwork of individual state regulations. A blue-black field of 5.2 million solar panels tilted toward the Arizona sun might just be the Hoover Dam project of the Great Recession. The Agua Caliente Solar Power Project hosts nearly 300 megawatts of silicon photovoltaics (PV) that turn sunshine into electricity. That made the Yuma County facility the largest working solar farm in the world when it opened in April 2014. But when it comes to mega–energy projects, Agua Caliente has competition, including four of the world’s largest solar-power plants to use the sun’s heat and one of the largest wind farms on the planet. And its all thanks to billions in loans from the U.S. Department of Energy’s Loan Programs Office (LPO). The most important thing the Obama administration has done to combat climate change may not end up being raised fuel-efficiency standards for cars and trucks or even its Clean Power Plan to cut carbon dioxide emissions from power plants. The most important thing may turn out to be the loans that enabled large power facilities that run on sunshine or Earth’s heat to break ground out west, wind farms to be built from coast to coast and construction of the nation’s first brewery for biofuels not made from food—as well as a host of other advanced manufacturing energy projects. The loan program got its start a full decade ago with the Energy Policy Act of 2005—legislation that aimed to provide incentives to produce energy in the U.S., whether by drilling for oil in the Gulf of Mexico or building new power plants. Only companies with established credit histories, however, like utility giant Southern Co., could take advantage of the loan program created by that bill. Companies behind new, alternative energy projects, like electric-carmaker Tesla Motors, typically did not have the benefit of such track records, however. As a result, almost no one applied for a loan. The loan program still required innovative technology, defined as “new or significantly improved technologies as compared with commercial technologies” (with commercial defined as used in three or more other projects over more than five years), but suddenly had a lot more money, specifically some $16 billion to loan before September 2011 on top of the $56 billion already available. The program also had the full expertise of the Energy Department to evaluate projects and help new technologies overcome the hurdles to commercialization, often dubbed the “valley of death” by those in the finance and tech industries. Those innovations range from the basic layout of solar farms of more than 100 megawatts to storing sunshine in molten salts and using lens to concentrate it and improve photovoltaic efficiency. Between March 2009 and August 2010, when the window closed for new applications, the loan program received hundreds of submissions. By September 2011, the $16 billion had been loaned to various renewable energy projects. An additional $16 billion in loans, guarantees or commitments have been made since then, including $8 billion to help build the nation’s first new nuclear reactors in more than 30 years in Georgia. All told, there is still $40 billion waiting to be used in the loan program, including the money in its Advanced Technology Vehicles Manufacturing program for electric cars, better batteries, more efficient engines and the like. Still a large portion of all those monies may never be used, given the challenges faced by carbon capture and storage and nuclear, although there is an “active pipeline” of projects being evaluated, according to Energy Department spokesman Brian Mahar. The loan program also now hopes to receive applications for Distributed Energy Projects, including solar on home rooftops, grid batteries and similar technologies, though that will likely require bundling together a large number of these typically smaller clean energy projects. Check out the excellent full article over on the Scientific American website, it’s a really fascinating read.